Andrea Ray is a teacher who has taught at the elementary, middle, and high school level. In real life, she has attended 25 years of professional development. She knows if teachers cannot use the information in their classroom, they consider the learning experience a poor use of their time. Andrea’s goal is to create a design process that produces relevant learning activities. Her website contains information about topics that relate to the learning design. Dr. Andrea L. Ray has an earned PhD in Education with a specialization in Instructional Design for Online Learning. For the past 10 years, her research interests have focused on topics that relate to the design of professional learning. Her published works include: Changed by Design: Using Instructional Strategies to Influence Teachers’ Attitudes (2008), and Creating Professional Development that Works: What Every Teacher Educator Needs to Know (2015). 1) Can you tell us more about your work? During the transition between my second work season (summer), and third work season (fall) I wrote my first book, Creating Professional Development that Works (1). It is a scholarly book containing in-depth theoretical and conceptual explanations of the design process. I am currently in my third work season (fall) and I spend my time trying to help teachers who develop professional learning activities for other teachers. My second book, Fulfilling the Needs of Teachers (2018) is a practical guide for teachers who develop professional learning activities. 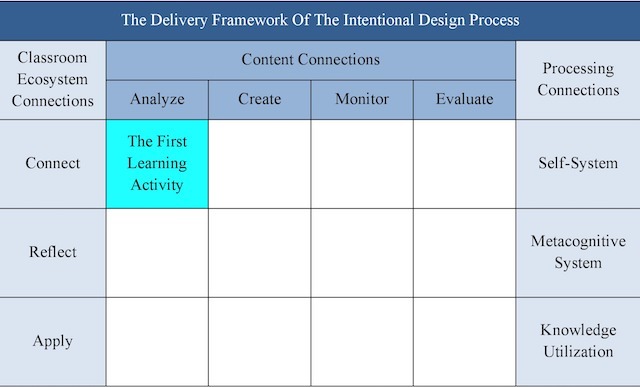 2) What made you decide to create this learning design? To be honest, I did not want anything to do with professional development because I had sat through 25 years of it and most of it was not useful to me as a teacher. However, on the way to earning a doctorate all paths led to professional development (see Photo 2). 3) How have you incorporated research into this design? I started with a single question, “Why are the majority of professional learning activities perceived by teachers as irrelevant?” What I found was shocking: if a learning design uses what research indicates works, it will align with what teachers want. It doesn’t work because the frameworks of the majority of current learning designs originate from research about professional development. This makes them one-dimensional in nature. You can probably guess what the third question was, “How do you design professional learning activities that fulfill teachers’ needs?” First, you need a three-dimensional framework that uses change strategies to meet teachers’ needs as adult learners (1, 8). The design of the framework must enable teacher educators to consistently create relevant learning activities that lead to lasting improvement in teachers’ instruction (Photo 3). Figure 1: The delivery framework of the Intentional Design Process categorizes three types of research-based connections. 4) How do you hope people use your book? Readers may find the book and an extended preview of the book on Amazon. Gettextbooks lists a wide variety of sellers. The book is also on IndieBound a community of independent local bookstores. 1. Ray, A. L. (2015). Creating professional development that works: What every teacher educator needs to know. Lanham, MD: Rowman & Littlefield Publishers. 2. Desimone, L. M. (2011). A primer on effective professional development. Phi Delta Kappan, (92)6, 68-71. 3. Marzano, R. J., & Kendall, J. S. (2007). A new taxonomy of educational objectives (2nd ed.). Thousand Oaks, CA: Corwin Press. 4. Knowles, M. S. (1973). The adult learner: A neglected species (2nd ed.). Houston, TX: Gulf Publishing Company. 5. Rogers, E. M. (1962). Diffusion of innovations. New York, NY: Free Press of Glencoe. 7. Clark, R. C. (2008). Building expertise: Cognitive methods for training and performance improvement (3rd ed.). San Francisco, CA: John Wiley & Sons, Inc.
8. Ray, A. L. (2018). Fulfilling the needs of teachers: Five stepping stones to professional learning. Lanham, MD: Rowman & Littlefield Publishers.